Audience: Armed professionals and LEO’s who operate AR-15’s that are looking for more experience, to gain knowledge and improve their shooting skills in urban environments or law enforcement situations. Scope: The curriculum is designed for entry level to intermediate operators in the safe and efficient employment of the AR-15 rifle. 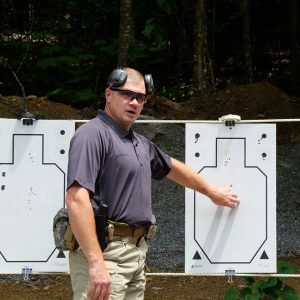 Instruction and practical exercises on the range will provide the student a solid skill set in basic to advanced shooting fundamentals and rifle manipulations. More experienced students will refine their current skill set and continue to be challenged as we ensure all shooters will stay engaged throughout the course. Training days are 8 hours, 8:30 am to 4:30 pm, with 30 minutes for lunch. It is highly recommended that you bring your lunch as you will have no options within 15 mins of the range. It is also recommended you have snacks, some will be available such as power bars, crackers and granola bars. Otherwise, please bring your own. Student should be physically able to get up and down from standing, kneeling and prone positions.